The players are paired: single mom and blind date, teen daughter and her best boy buddy she wishes were more, and a comfortable middle-class husband and wife hoping to become adoptive parents. Their storylines intersect primarily to propel the narrative of the couple at the heart of the show: Nance, the mom (Katherine Keberlein) and daughter Evie (Anne Joy). Nothing extraordinary occurs between these two, or between any of these characters, but much of playwright Courtney Baron’s dialogue is uncommonly honest and frequently funny. The characters are stereotypical in their desires and affectations but attain individuality in their complexity. It works because the cast delivers on the humor inherent in the cliched bits of characterization while never letting their melodramatic moments turn maudlin nor campy. Regina Garcia’s scenic design furthers the sense of isolation that threatens all the participants, with the stage split like an exposed doll house and the interactions between the shifting sets of players confined mostly to single sections of the divided stage. Occasionally, your view can be meaningfully obstructed. Most notably, for one pivotal, fraught scene between Evie and her friend/crush Colin (Andrew Goetten) I could only see Colin fretting, whereas the folks seated on the opposite side presumably saw Evie panicking. 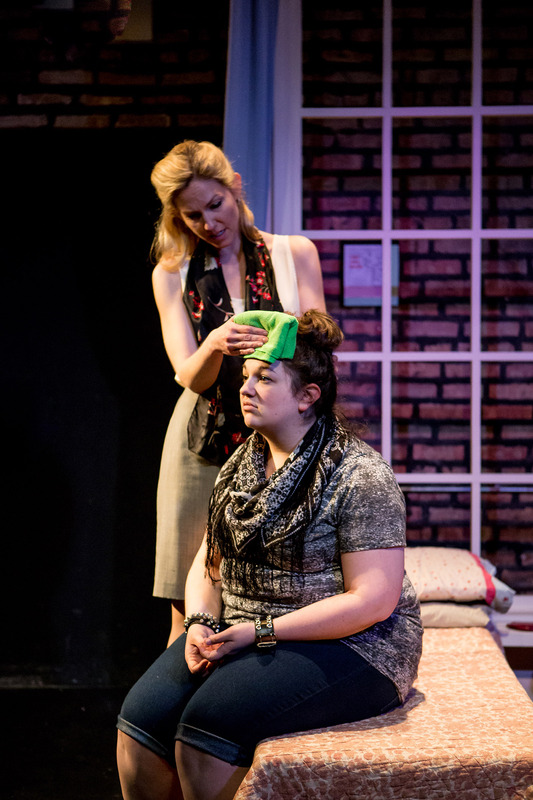 There’s much fretting and panicking throughout “Eat Your Heart Out” but, under Hallie Gordon’s direction, Rivendell Theatre’s production thankfully never grates. There are also some downright punchlines in Baron’s script. The most entertaining moments of the play occur when the fretting, the panicking and the punchlines collide. That happens primarily during the scenes featuring the comically nervous yet self-consciously mannered Alice (Mary Cross) and the dauntingly defensive Gabe (Michael Szeles) as the prospective parents anxiously preparing for, and then horribly derailing, their in-home visit with Nance. Evie’s mom, in her professional role as part of the adoption screening process, is pivotal to the married couple’s hopes. Alice and Gabe are a malfunctioning marital unit of high-grade-sitcom vintage and provide the play’s sustained stretches of humor. Both in the nervous overreaching in their initial conversations with Nance and in their manic and indignant unraveling that follows, Cross and Szeles are hilarious and sincere. Rivendell Theatre Ensemble, 5779 North Ridge, (773)334-7728, rivendelltheatre.org. $30. Through June 28.